44.4% of the Spanish population aged between 16 and 74, that is to say, 15.4 million people, use the Internet on a daily basis. Almost 27 million individuals aged 10 or over have accessed the Internet at some time. The difference between men and women in Internet use has been reduced over the last years,mainly in the group of users who access the Internet every week. 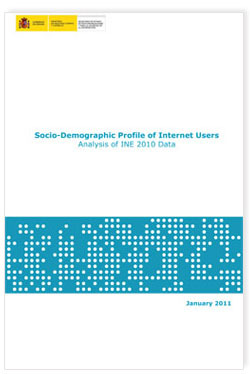 The age variable is a differentiating factor: the higher percentage of Internet users is found inthe younger age groups. Almost all students have accessed the Internet at some time. The level of completed education is also a determining factor when it comes to Internet use: the higher the level of education, the higher the percentage of Internet users.